“Crazy” Aunt Lois died last week. I have two Aunt Loises. 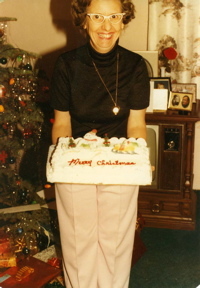 This Aunt Lois was a diagnosed paranoid schizophrenic, therefore unofficially dubbed “Crazy Aunt Lois.” Mom decided that wasn’t very nice, so we officially dubbed her “Lois J.” to differentiate between the two Aunts. Anyhow, my family doesn’t handle mental illness well and pretty much resented her existence. They decided not to have a memorial for her. I guess she is going to be cremated, but I don’t know what will happen to her remains. I like Crazy Aunt Lois. She was a daily part of my life for many years. Even though I haven’t seen her for years, I think of her often. This is my memorial to her. My Grandma was married and widowed before she met my Grandpa Vern. She had three children from her first marriage, one of them was Lois. The story is that Grandma had measles when she was pregnant with Lois and this caused several birth defects including deafness and mental illness. The story also characterizes Lois’ father as an impatient and mean man, especially when he had been drinking. He would supposedly call Lois to the dinner table; she wouldn’t respond (they didn’t realize she was deaf until she was older); so he’d beat her. This, of course, could also cause mental illness. Grandma seemed to feel terribly guilty about Lois, so she decided to check Lois out of the Utah state mental facility. This decision had emotional, legal, and financial ramifications beyond anything anyone could have realized at the time. Who’s to say what stories are true or not, but the simple fact is Lois was deaf and paranoid schizophrenic. There was little medical, financial, or legal support for her or the family. This made her life hard and it also made her hard to deal with. I don’t remember exactly how old I was when Lois came into my life (I was very young) but I do remember the event. The way I remember it (which is by no means factual) is that somehow Grandpa and Grandma had found out that Lois was living in Utah in a building that was about to be condemned. Dad and Grandpa were to go fetch her and bring her to Nevada to live with Grandpa and Grandma. When Dad and Grandpa got to the condemned building in Utah, they found Lois living with 50 cats in total squalor. 50 cats! Since I absolutely adored cats, but was not allowed to touch them (Mom forever believes that all cats carry ringworm) Aunt Lois instantly became an intriguing and heroic figure to me. I remember Aunt Lois’ looks very clearly. I think she was about 15 years older than my father. She already had gray hair when I first met her. She was tiny. I’d say probably 5 feet tall or so, and she was thin. Her salt and pepper hair was slightly wavy and shoulder length often held back by clips. She wore 50′s style cat-eye silver glasses (which I loved!) and she was one of my few family members who wore make-up, often blue eye-shadow and thick super bright lipstick. She always put her lipstick on crooked. To this day when I see someone with crooked lipstick, I instantly assume they are mentally ill.
Aunt Lois spoke funny. You could understand what she was saying, but she had what I now realize is a deaf person’s accent. She could not hear much at all by the time I met her, but she could read lips with amazing accuracy. Now that I think back about several incidents I realize Aunt Lois really was parnoid schizophrenic, even though people claim it is a rare disease. It didn’t phase me at all. I don’t know why. Maybe because I was a child I accepted things more readily. I was afraid of The Blob, sharks (I lived in Nevada – a land-locked state), and bears. I believed my stuffed animals had a secret underground life with villages in the walls. Why wouldn’t I accept Aunt Lois’ beliefs and fears? Aunt Lois was Mormon. I’m not sure why, as noone else in my family was Mormon, but she was very devout. I should mention that I stayed at my Grandpa and Grandma’s house every day after school until my parents were off work. I was usually there on the weekend, and I was also there a lot during the summer. I was bopping through their house one day when I spied Lois gazing into a window and talking to someone. It seemed like a very private conversation, so I left her alone. Later, though, I unabashedly asked her who she had been talking to. She explained to me that the Angel Moroni often appeared to her in windows and mirrors. (The Angel Moroni was a resurrected being who brought The Book of Mormon to Joseph Smith.) She never told me what The Angel Moroni discussed with her. I figured that was her business Moroni being very sacred and all. Of course I believed her, because every little girl believes in angels and fairies and unicorns, so why wouldn’t I? Aunt Lois’ paranoia caused her a lot of pain and anguish. One time Mom received a call at work that she had to help calm Lois down right away. (Mom was one of the few people who Lois seemed to trust.) When she arrived at Grandpa’s house, Lois was cowering, terrified under the patio furniture in the back yard. We lived in a town with a Naval air base. There were constantly jets flying over and daily sonic booms – you get used to it. On that particular day, the jets were practicing some manoeuvres and had been flying quite a lot. Lois was convinced that the Navy was spying on her because she was having her period. Mom calmed her down and talked her out from under the furniture. Folks, PMS is tough enough without the added effect of extreme paranoia! In my memory, the price of gold was a big deal when I was a child in the 70′s. It seemed like it was announced every evening on the nightly news. Lois was obsessed with gold bullion. I remember she was extremely angry with one news station because they only verbally announced the price of gold and did not put it in a visual on the TV screen. Clearly they were doing this to specifically keep the price of gold from Lois and she was not happy about it. She called them, several times, to let them know! She also ordered gold bullion over the phone. Grandpa got a call once while I was there from one of those TV advertising places where you could buy gold or invest in gold or something. Apparently Lois had “ordered” some gold, but they were suspicious (I bet those places get a lot of calls from mentally ill people). I don’t know if she used one of Grandpa’s credit cards or what, but Grandpa handled it like it wasn’t a big deal. I remember the police calling Grandpa once (the police knew Lois well) because she was at the police station in a total panic. She had been gardening and found a discarded lighter in the flower bed. She was convinced that there was a tiny camera in the lighter and They were watching her. She had hightailed it down to the police station and was demanding the police do some sort of forensic processing of the lighter and protect her. And this brings us to Them. They are very bad. They are always watching you. They know everything. Once when I was older, about 12, Aunt Lois cornered me in the laundry room and told me now that I was growing up she wanted to give me some advice. OK, I was all ears. She told me, “Never trust Them.” I told her I never would, and she was happy with that response. Funny that twenty years later one of my most favorite TV shows, The X-Files, was based on that very premise. I’ve always considered that advise pretty good advise, even though I’m still not entirely sure who They are. Mom was always kind to Aunt Lois. When Lois took her meds she was quite focussed and smart. Mom hired her to do a lot of typing and writing, and Lois was great at this. We always gave her birthday and Christmas gifts and it seemed like we may have been the only ones. She loved cats, so every Christmas we bought her a cat calendar. She reciprocated with some of the most memorable gifts Mom and I have ever received. We received the best gift from Lois after we’d moved to another town. It was a surprise because we didn’t see her much anymore. It arrived in the mail one day. It was in a small envelope with Lois’ return address. Inside the envelope was a single monogrammed sterling silver fork. We were simultaneously freaked out and honored. To this day Mom still has The Fork. When I told her Lois had died, Mom said she’d eat dinner with The Fork in memorium. Lois also had a some creepy predictive flashes. Mom’s most memorable encounter with her was many years ago – back when my family was whole and seemingly happy. She called Mom one day with some very serious and important news. Mom patiently listened. It seems Lois had had a vision of Mom in Heaven, and Mom and Dad were not together. She wanted Mom to know that somewhere along the line she and Dad would separate and they would not be together in Heaven. Seven years later, Mom and Dad were divorced. Sadly, meds and doctors were one of Lois’ biggest paranoias. She would refuse to take her meds and could not be forced by the family because the woman fought like a wildcat. Inevetiably she would become sicker and sicker until it would culminate in her attacking Grandpa. I don’t completely understand why Grandpa was the target of her anger, as he was quite tolerant of her. He was the head of the household though, and since he controlled the household money maybe she saw him as one of Them. Maybe she had issues with men. Who knows what happened to her all those years in Utah. I bet most of it wasn’t good. Anyhow, I specifically remember one incident when she sneaked up on Grandpa and clobbered him from behind with a cast iron skillet. Since she was so tiny, she was only able to reach his back – lucky for him because if she had hit him over the head it probably would have killed him. He spun around and punched her out. Then, of course, they called Mom. At this point, Mom and Dad would be able to institutionalize Lois because they had proof she was dangerous. She’d live at the state facility where professionals forced her to take her meds. She would get better, and was really very calm and functional when she was on her meds. They’d release her because she was ‘better,’ and at that time, nothing the family did could keep her institutionalized. Then, the cycle would start again. It was hugely frustrating, expensive, and dangerous to Grandpa to take care of her. I think this is when the family really started to resent her. They had no help from the state or insurance, and it seemed like the family had few legal rights. While Grandma was alive everyone tried to take care of Lois, because it was really important to Grandma. After Grandma died, it seemed clear that it wasn’t safe for Grandpa and Lois to live together, so my Uncle shelled out money for Lois to live in her own place. At that time though, the family pretty much walked away from her. They made sure she had a place to live, but stayed as far away as they could. I think she lived like a street person for awhile. I saw her wandering around in a park once in Reno, about 60 miles from her home. To this day, street people don’t make me that uncomfortable or angry. I have a lot of sympathy for them. I always think about Aunt Lois and how she couldn’t help being mentally ill and how there didn’t seem to be anything that could really help her. The last time I saw her was at my Uncle’s funeral. She was sitting at a card table by herself, eating. The family was studiously avoiding her. I plopped down next to her, because it just isn’t right to ignore her! She instantly remembered me and was very glad to see me. She wanted to know what was up in my life. I told her I had gotten married. It turns out that she too was engaged! (Lois had had a boyfriend [figment of imagination boyfriend] since her time in Utah.) We had a lovely chat about her wedding plans. My Dad didn’t get why I’d even give her the time of day or discuss such silliness with her. Like she was making stuff up on purpose! My thinking was that her life was so scary that if some of her illusions were happy, why not let her be happy while she could? I guess after my Uncle died another Aunt took over Lois’ care. Awhile ago she moved into a hospice facility. Dad wouldn’t talk about her much and when I did bring her up we’d often end up in a fight about it. I don’t understand how you can blame someone for their mental illness, but I guess we each deal with these kinds of things in our own ways and some people just can’t deal at all. I don’t know what she was ill with, but she was probably over 80 when she died, so she lived a long, and I would guess not very fulfilling life. I was sitting on my bed steaming mad, when something occurred to me that made me feel instantly at peace. I read this book once (a fiction book called The Lovely Bones by Alice Sebold) that had a beautiful idea of Heaven. In this book, Heaven is a very individual place that differs for each person. For a child it might be a lush green playground, for instance. It occurred to me that now that Lois is dead she can actually be herself – the true her at the core of her heart without the mental illness – in Heaven, or my dreams of Heaven anyway. I envisioned her as a little girl again, with long braids tied with bright ribbons and wearing a frilly dress. In my mind’s eye she is skipping though a field of wild-flowers and holding balloons. She is completely stripped away of the layers of fear and paranoia. She can hear the breeze and the birds. She is happy. She is the real Lois that we only got to see glimmers of during her life. She is at peace. I love you Aunt Lois. You really made an impact on my life. You taught me about mental illness and compassion and that you can’t blame people for things that are out of their control. I’ll never forget you. I heard an interesting interview on NPR with Pete Earley who wrote the book Crazy. I haven’t read the book yet, but I think it looks like a great starting point if one wants to read more about living with mentally ill people. This entry was posted on Thursday, May 24th, 2007 at 8:56 am	and is filed under The Uninspired Family. You can follow any responses to this entry through the RSS 2.0 feed. You can leave a response, or trackback from your own site.